Everyone has a story. Some folks live theirs privately...some live them out loud. Andria Hall, my friend, my mentor, my client, my sister ... was the most authentic person I knew and lived it out loud. She walked her talk. She loved God, her family and her work. 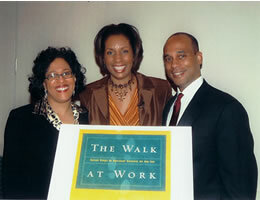 Her book: The Walk at Work. She was a "PK" and a best-selling author of several Christian books. And she had a two-decade career in TV and was an Emmy award winner and former CNN anchor. She is gone now. She is in heaven. We lost her to breast cancer in 2009. She is the reason for my passion for ministry marketing. She listened to my vision about this company in 1998. She actually didn't become a client years later after her book came out. God's timing. Andria died at 51 three years ago. I am turning 52 on Saturday, May 26. I miss her so much. That's why I am doing the RACE FOR THE CURE in her honor and two other close friends who died from breast cancer. If you would love to help me honor them and raise money for this cause, see my page at FirstGiving. I have blogged this, tweeted it, pinned it, youtubbing and facebooked it. Social Media, to me, is for social good. My mission is to market the message. What an awesome time we live in with the technology and social media. Won't you help? See www.PamPerry.org too and join www.ChocolatePagesNetwork.com! See video at www.PamPerryPRCoach.com too and join www.launchlikeasuperstar.com! Sharing is what makes social media SOCIAL. And most people don’t really understand if they should share and participate in Facebook. And the "Like Pages" are really confusing to most. What type of messages? Who should they friend? Should you try the push approach, broadcasting on Twitter to engage on Facebook? Or how about what should you "brand” on Facebook? And how do should that look? See this powerpoint on how to increase your interaction on Facebook. See www.PamPerryPR.com too and join www.perrywilliamson.com/join!